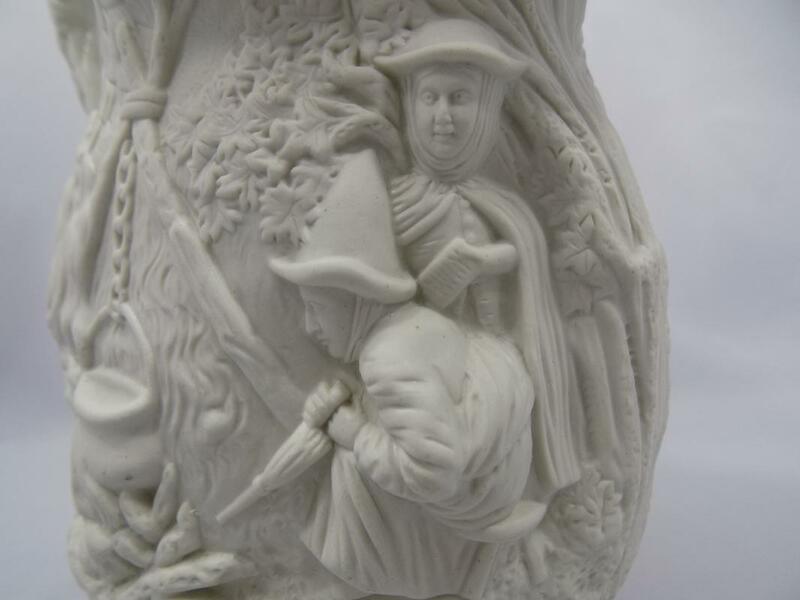 This molded porcelain jug was created by the firm of Jones & Walley in Cobridge at Staffordshire, England. 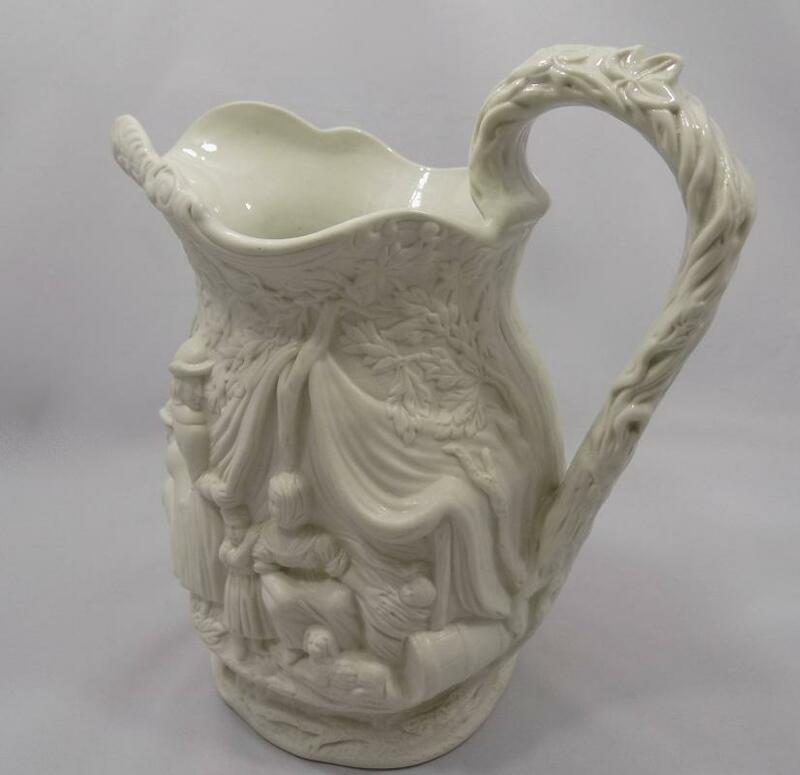 Elijah Jones and Edward Walley were in partnership from 1835 to 1845, during which time they produced this beautiful pitcher of Parian ware, so-called to evoke the name of Paros, the Greek isle where much of the fine white marble used in ancient statues came from. 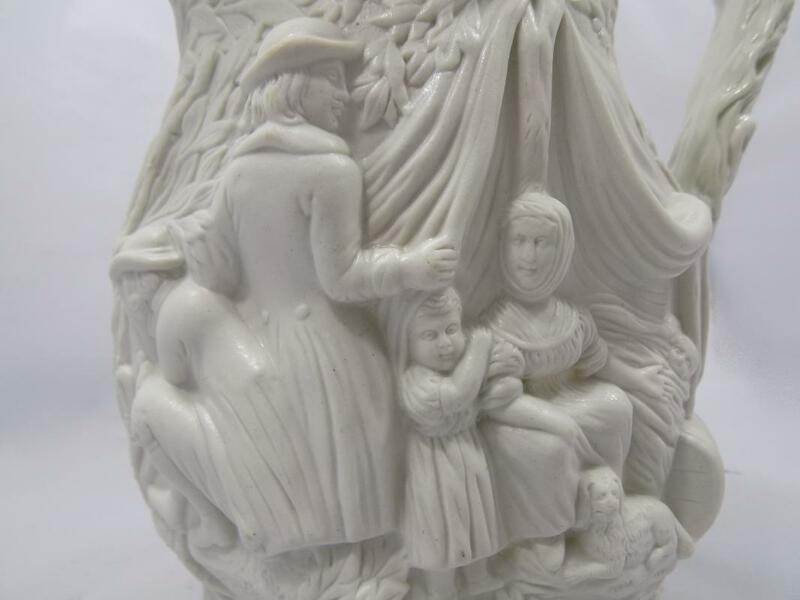 The design is called "Gipsey" and features incredibly detailed genre scenes in high relief, ostensibly of gypsies at their campsite (middle and upper class people in Victorian England were both fascinated by and fearful of gypsies--those "Egyptian" immigrants who were actually from India). 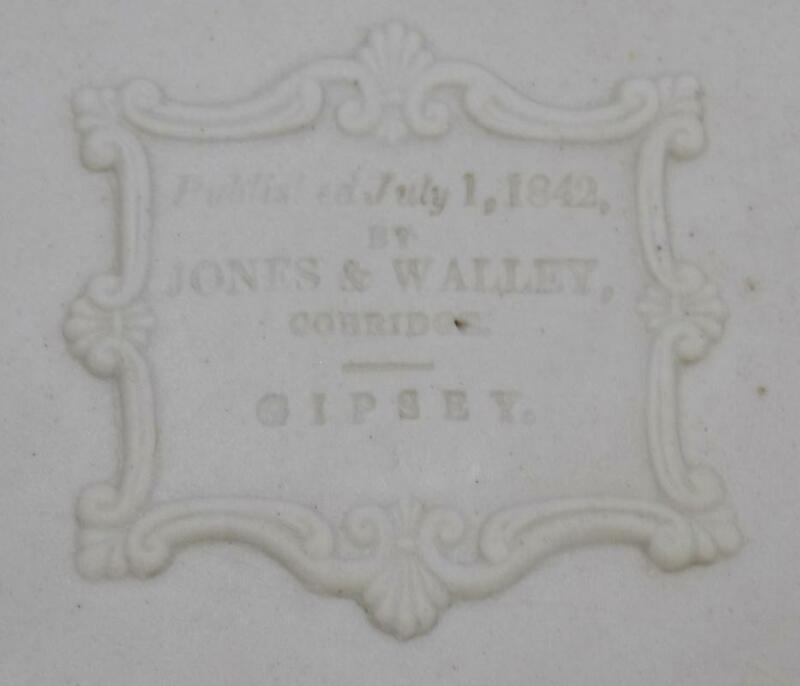 The date given is for the introduction of the design, not necessarily the date of manufacture, which would have been 1842 through 1845. Hollow pieces that were molded like this one show impressions of the outer decorations on the inside of the piece. 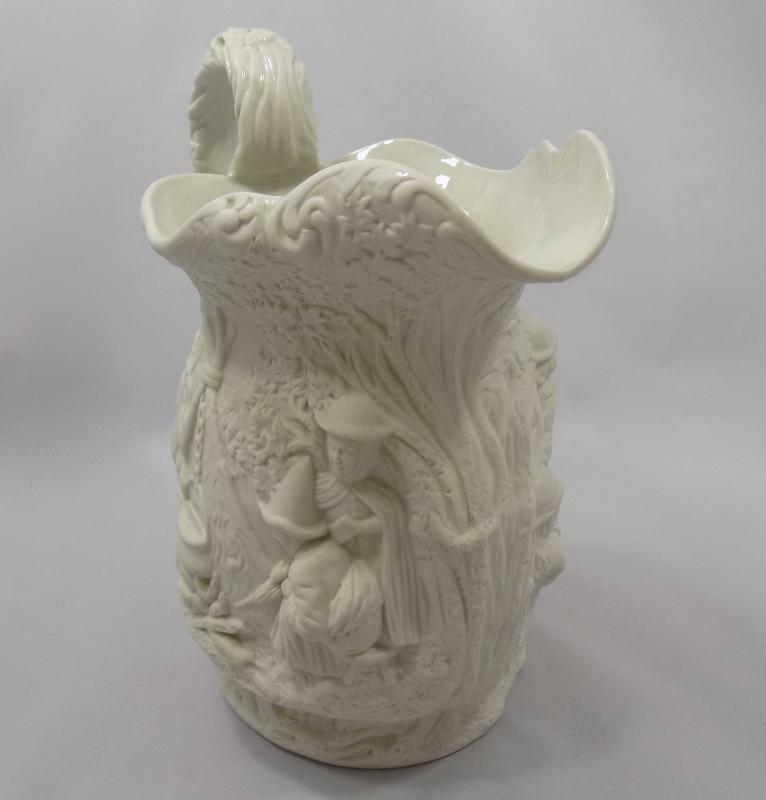 The molded designs cover almost the entire outer surfaces of the jug, including the handle and undersides of the spout. The exterior is matte while the interior has been given a glossy glaze, the better to hold ale. 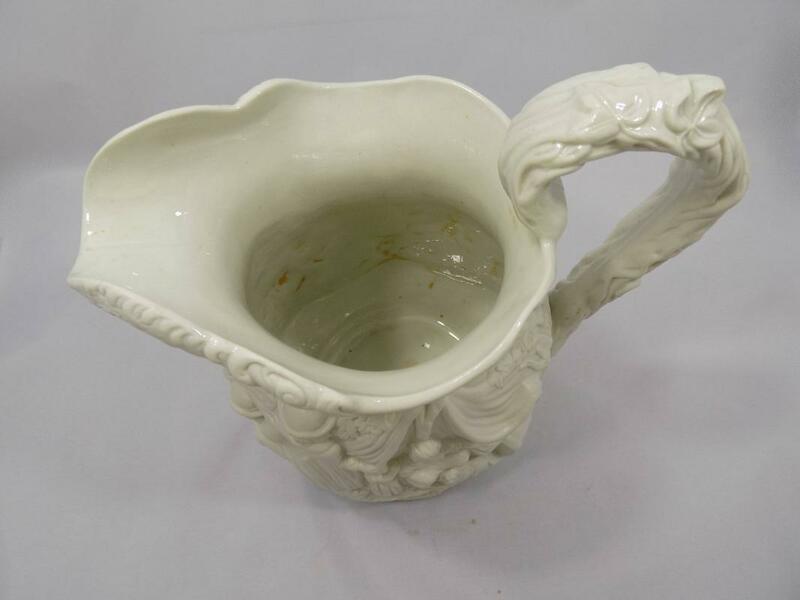 This pitcher measures 10 inches tall to the top of the arched handle, 9 inches across from spout to handle, 6 inches front to back and weighs 4 pounds. At least 170 years old, it's in excellent condition with no chips, cracks or restorations. The interior has some rust-colored stains as its only signs of use and age (please zoom on photo # 5). 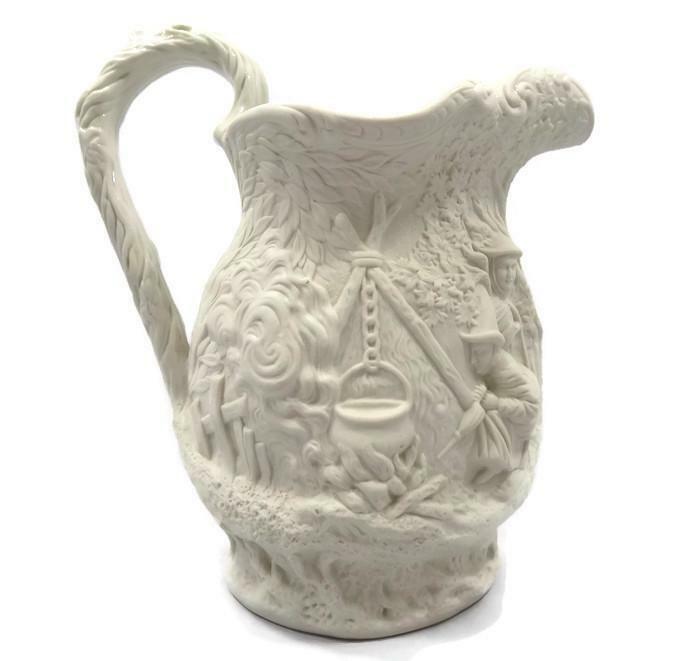 This large Parian ware jug is striking in its subdued elegance and at home in both period and contemporary settings. 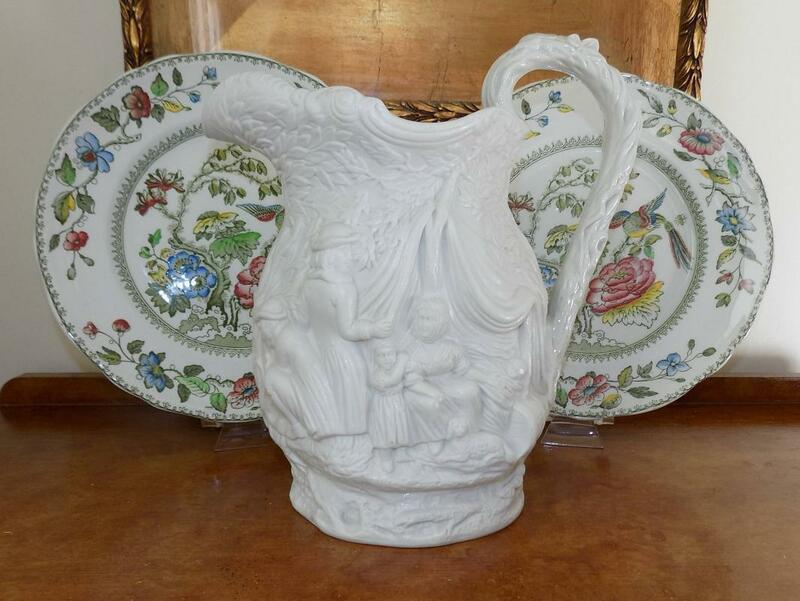 Please note: This jug is not stark white--as it appears in the photos with the Crown Staffordshire porcelain plates--but is a soft off-white, often described as "ivory." The remainder of the photos more accurately represent the actual shade.